I am having a "Christmas in July" kind of a day. I am making blocks for a Christmas quilt. 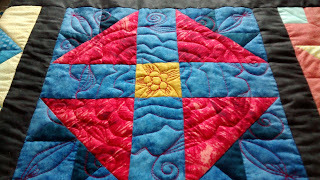 I love to experiment and try new things with every quilt I make. This time I am experimenting with gold fabric. It is quite thin and seems like it would fray very easily. I bought one meter of it. I also bought one meter of lightweight fusible interfacing. I placed the gold fabric down on the floor (carpet), then placed the interfacing on top of it. I put my iron on the "synthetic" setting which is low heat then slowly ironed over the entire surface. The two were nicely fused together and ready for cutting. Now I am finding the fabric easy to work with. No fraying whatsoever. No distortion when I am sewing the pieces together. If you would like to make your flying geese four at a time, you may find this chart helpful for figuring out the sizes to cut your fabric.